Looking for something fun and interesting to do this Labour Day long weekend? Well, look no further because I am about to share with you a few different ways enjoy your extra day off. 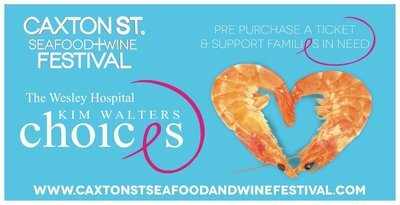 If you love seafood and wine, then you must check out the annual Caxton St. Seafood and Wine festival. Queensland's biggest street party turns 18 this year, and aims to set the bar even higher than in previous years by offering a fantastic selection of seafood, wines, an incredible line up of performing artists from across the country, and of course over 15,000 of your closest fellow seafood and wine lovers! The party starts on Sunday the 6th of May at 11am and wraps up somewhere around 10pm. Tickets are $29 per person and children are permitted entry if accompanied by a reasonable adult. Pre purchased ticket sales support the Wesley Hospital Kim Walters Choices fund. Don't miss the journey of a lifetime, exclusive to Brisbane from the British Museum, This spectacular exhibition will reveal the life and death of a temple priest who lived almost 3,000 years ago. The mummy has remained intact and untouched for almost 3000 years, unlike many other mummies found in ancient Egyptian tombs. Enjoy a combined 3D film and exhibition experience which will detail and explore his mummification and lead you on a journey to uncover the rituals of life and death in ancient Egypt. Pre-booking is essential with prices ranging from $12.65 for kids to $21.45 for adults or families (2xadults, 2xkids) can purchase a pass for $59. Tickets are available from FoxTix. Enjoy a picnic and barbecue this weekend in one of Brisbane's favourite parks. Only three CityCat stops from the CBD, the inner-northern village of New Farm has long been a place to connect with others. New Farm Park covers 37 acres and currently includes soccer grounds, tennis courts, and basketball courts. The park is noted for its large rose gardens, which contain hundreds of varieties of rose, and over forty thousand individual plants. Pack a picnic, through a sausage onto one of many public BBQs and relax in the beautifully shaded surrounds on a deck chair or checked rug. The historic Brisbane Powerhouse, situated right next to New Farm Park, is also a must-see, playing host to live arts, weekend farmers markets. Whether its prawns and champagne, discovering the secrets of ancient Egypt or enjoying an Aussie BBQ in one of Brisbane's most historic parks, there are plenty of ways to make the most of the extra day off this Labour Day long weekend.